Triggers are fully customizable hanging rear-view mirror placards. 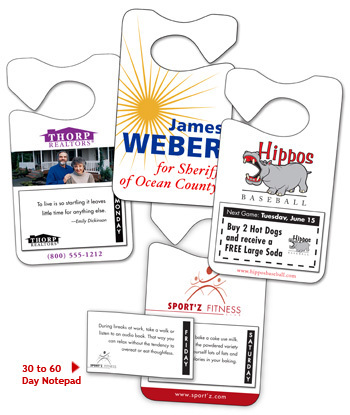 They can feature your client’s contact information and a 4-color logo on both sides. The front can have a 30 or 60 day notepad affixed to it. This customizable notepad can feature a calendar with inspirational quotes, humor, sports & leisure tips, self-help tips (e.g. weight loss, quitting smoking), election day countdowns, or whatever else you can think of. You can even place coupons or ads interspersed throughout the pad. Because the back of the Triggers is printed with a logo, your brand will be viewed by on-coming cars. Triggers can also be used on door knobs as a reminder or for advertising as well.